特异性 BLAST analysis of the peptide immunogen showed no homology with other human proteins. 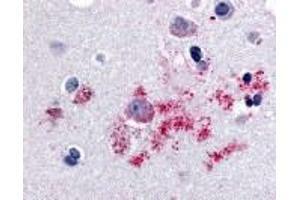 免疫原 BAI1 antibody was raised against a peptide located in the N-Terminal domain of BAI1 (Human). 背景 BAI1 is an Orphan-B GPCR with an unknown ligand. BAI1 is postulated to be a member of the secretin receptor family, an inhibitor of angiogenesis, and a growth suppressor of glioblastoma. Along with BAI1, there are two other brain-specific angiogenesis inhibitor genes, designated BAI2 and BAI3, which have similar tissue specificities and structures. However, only BAI1 is transcriptionally regulated by p53. Loss of BAI1 expression has been implicated in glioblastoma. 应用备注 BAI1 antibody can be used in immunohistochemistry starting at 10 - 15 μg/mL. 缓冲液 PBS, 0.1 % sodium azide. 注意事项 As with all antibodies avoid freeze/thaw cycles. 储存方法 BAI1 antibody should be stored long term (months) at -80 °C and short term (days) at 4 °C.